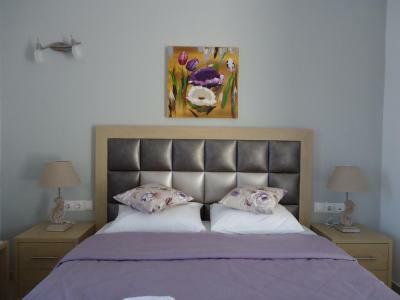 Lock in a great price for Rita's Place Hotel – rated 9.1 by recent guests! The place is amazing... The view is spectacular from any room. If you call ahead Rita will pick you up from the ferry.. she's an incredible cook and she's an awesome host and will cook you the best omelette of your life.. They make you feel like family.. Kudos to you Rita.. We will always book with you. 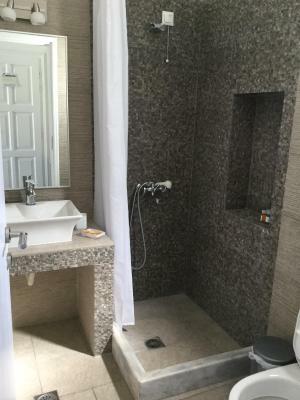 Great location, steps away from bus stop which takes you right to the main village. You could also walk to the village. 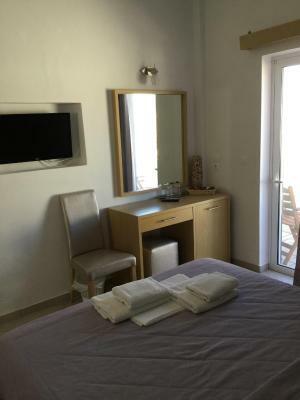 Comfortable rooms, Rita was very helpful. Ferry shuttle was very smooth. We enjoyed our stay! Pool area is great! Nice size and looks over towards beach. The rooms were ideal for our short stay. Rita was very accommodating, picked us up from Port and took us when we needed. 5-10 minute walk to main town. Would highly recommend. Great staff, very helpful and friendly. Great location. Great pool amenities. Rita was so friendly and accommodating. The hotel is lovely and in a great location. The views over the port from the pool are amazing, great to watch the sunset. Free transfers to and from the port which was great. This hotel is wonderful and has a beautiful view over Ios, i.e. Yialos beach. 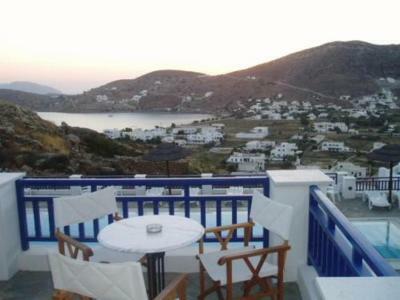 It is situated about midway between the port and the main town, Chora. There is a nearby bus stop for those who do not like walking. Rita transported us on arrival and departure to her hotel. She is very helpful and I would give her 10 out 10. Thank you Rita. 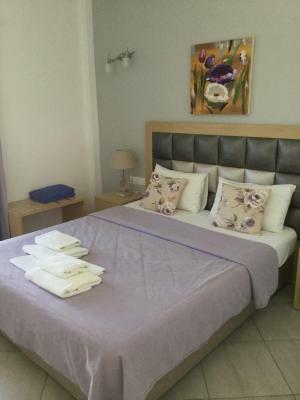 Rita's Place Hotel This rating is a reflection of how the property compares to the industry standard when it comes to price, facilities and services available. It's based on a self-evaluation by the property. Use this rating to help choose your stay! 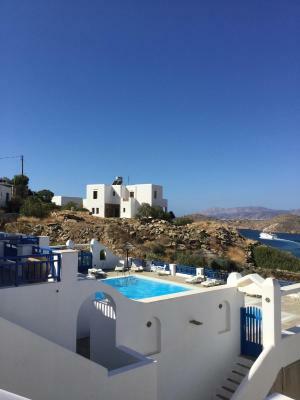 One of our top picks in Ios Chora.Rita's Place is a family run complex of 10 rooms overlooking the beautiful resort of Yialos, only 5 minutes walking distance to Ios Chora. 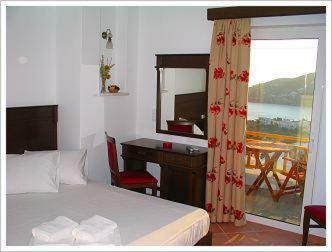 There is a great view of Yialos Beach from almost all of the rooms. 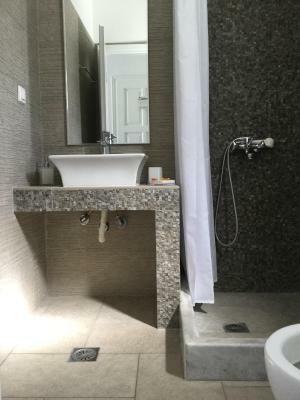 The owners are renowned for their friendly service and helpfulness. 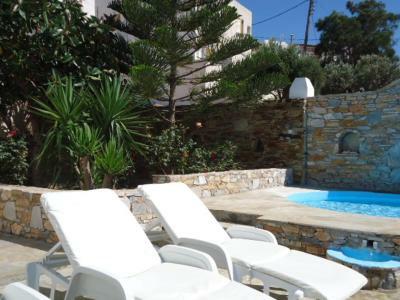 Enjoy your drink while relaxing around Rita's pool and marvel at the beautiful sunset. 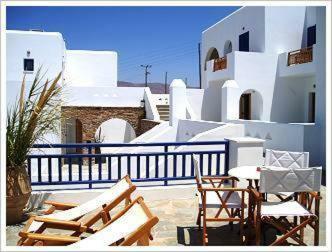 Free Wi-Fi is provided, as well as free shuttle service from and to the port of Ios Chora. 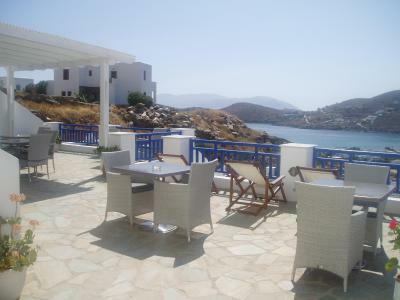 There is also a bus stop 150 feet from Rita's, which allows you to easily reach the beaches of Ios. 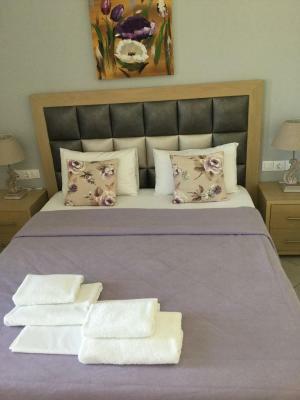 When would you like to stay at Rita's Place Hotel? 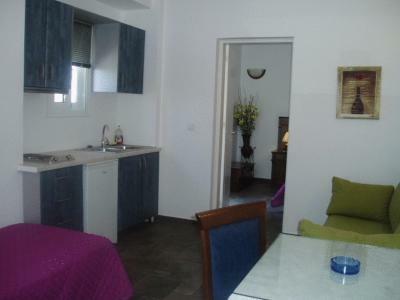 Opening out to a furnished balcony, this air-conditioned room features a TV, a fridge and free Wi-Fi access. 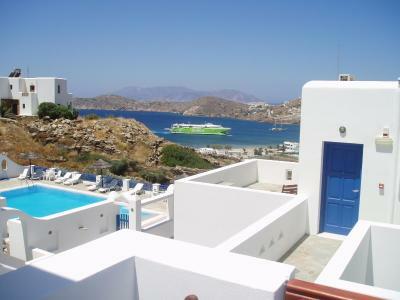 Most rooms offer views over the Aegean Sea and the pool. 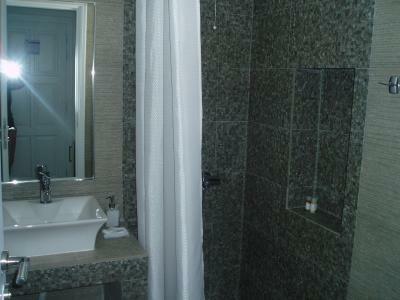 This air-conditioned suite consists of a separate bedroom and a kitchenette with seating and dining area. Offering free Wi-Fi access, it opens out to a balcony. 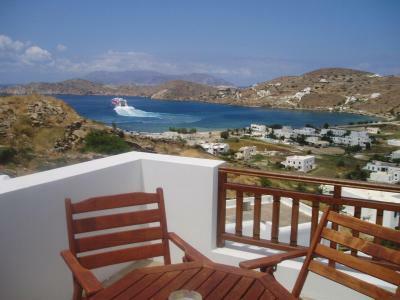 Most units enjoy views over the Aegean Sea or the pool. House Rules Rita's Place Hotel takes special requests – add in the next step! Rita&#39;s Place Hotel accepts these cards and reserves the right to temporarily hold an amount prior to arrival. Rita's Place Hotel accepts these cards and reserves the right to temporarily hold an amount prior to arrival. 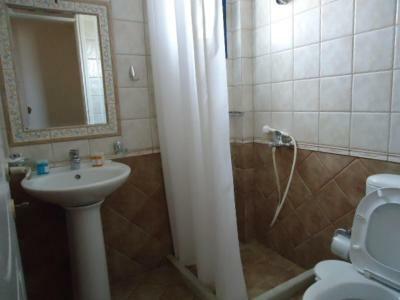 The decor of the rooms is a little dated and the bathroom was quite small but that wasn't really an issue. The exterior of the hotel is great and the pool area is a rally good size. 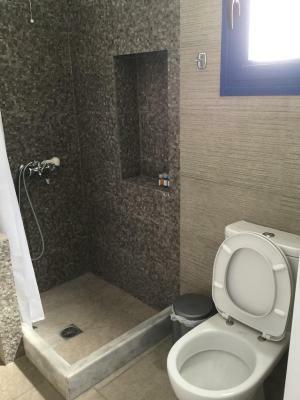 Everything was excellent, however, for people who cannot walk a lot, or have disabilities, they may want to choose a hotel nearer the port for easier access or on ground floor. For active people, this hotel is perfect. 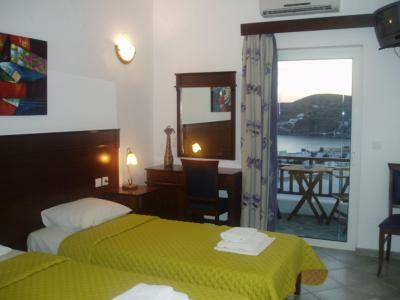 Hotel was in a great location, less than 10 minute walk from both the town and the port, where there is a nice beach. Rita was a lovely host, she collected and dropped us to the port and was there for anything we needed. Hotel was very clean and pool area was very nice with a good view. Would highly recommend! 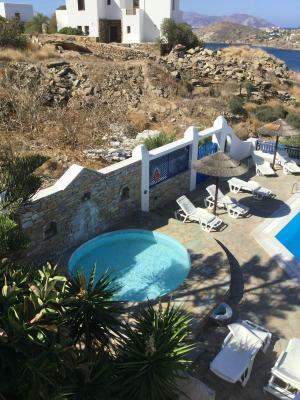 Very nice hotel, well located even if you do not have a car (bus stops close to the hote, Chora village at like 4-5 minutes walking and the port at 20 minutes walking). The rooms are nice you can have a very nice view . 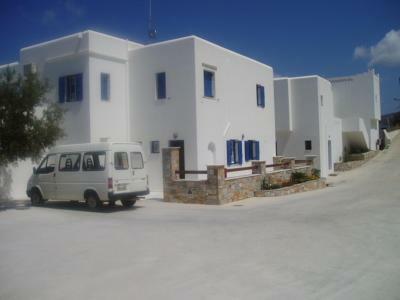 The owner is a nice host and even offers transfert to/from te port. Great service and location. Got picked up from Port and dropped off at Port free of charge. Will definitely be returning. Incredible accommodation!!! 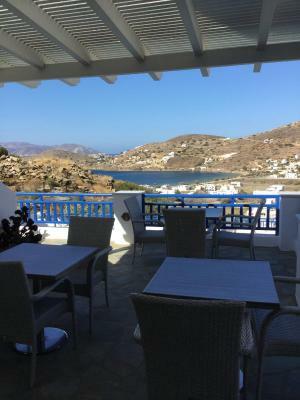 Rita came and collected us from the ferry port then showed us to the room which looks out over part of the town where you can watch the sunset from too! 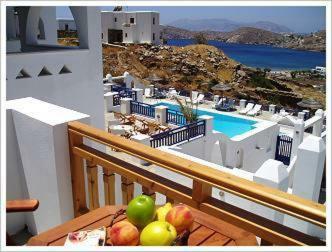 Daily room service, beautiful pool big enough for swimming, laundry service and wifi were great. 10 min stroll to the main strip of shops, and 2 min walk to the bus stop that takes you out to the beach & Farout Beach Club. Everything was so convenient and Rita was always around to help with queries.